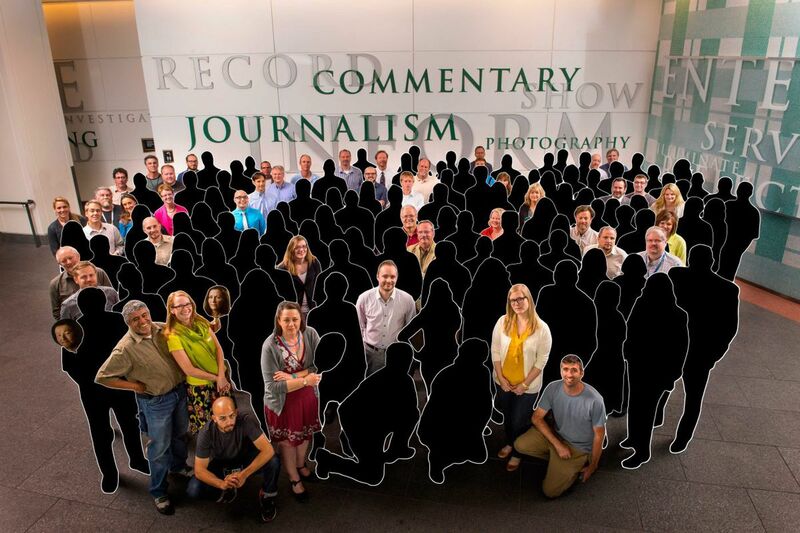 In a special editorial section decrying newsroom cuts, the Denver Post offered an illustration showing how few of the staff from a 2013 photo remain at the paper today. A stunning editorial appeared in the Denver Post last week. The editorial board of Colorado's largest newspaper called upon its owners to sell the newspaper before they completely destroy it. Headlined "As Vultures Circle, the Denver Post Must Be Saved," this bold appeal was leveled at Alden Capital, a New York-based investment firm that at one time was a major shareholder of the Inquirer. The editorial begins: "At the Denver Post on Monday, more than two dozen reporters, editors, photographers, videographers, page designers, digital producers, and opinion staff will walk out the door. Our marching orders are to cut a full 30 by the start of July. These heartbreaking instructions raise the question: Does this cut, which follows so many in recent years that our [newsroom] ranks have shriveled from more than 250 to fewer than 100 today, represent the beginning of the end for the 'Voice of the Rocky Mountain Empire'?" The editorial closes with both a dire warning and an appeal to the Denver community to step up to save the Post: "The smart money is that in a few years the Denver Post will be rotting bones. And a major city in an important political region will find itself without a newspaper. It's time for those Coloradans who care most about their civic future to get involved and see to it that Denver gets the newsroom it deserves." I am one of many in the world of public service journalism who read this cry for help with both empathy and respect. Empathy for the challenges that a fellow news organization faces in providing the journalism its city deserves, and respect for those determined to stand up and fight for it. My colleagues and I also reached out to our brethren in Denver to draw their attention to a model for saving important local journalism that might resonate in their city, just as it has in ours. Four years ago, after multiple changes of ownership, including that of Alden, the Inquirer was purchased by H.F. "Gerry" Lenfest, a local cable television entrepreneur turned philanthropist, and rededicated to the service of its community. This was not in itself unique. Newspapers in Washington, Boston, Minneapolis, and most recently Los Angeles have each been purchased by wealthy new owners committed to fresh investment. But Philadelphia's owner went a step or two further. He reorganized the news enterprise itself as a public benefit corporation charged not with maximizing near-term profits but with sustaining a profitable journalistic enterprise in the public interest. He then donated substantially all of the equity to an endowed non-profit organization now called the Lenfest Institute for Journalism, dedicated to investing in the future of local news in Philadelphia and nationwide. Many others in the Philadelphia community joined the cause: Leading venture capitalists and digital media entrepreneurs, prominent money managers, local attorneys, real estate investors, the local community foundation, the deans of schools of journalism, and former editors and reporters. These stakeholders have collaborated to help fund and oversee investment in new investigative news coverage, new technology for the news operation, improved digital products for readers, and greater diversity in both the newsroom and its audience, each a key building block for sustainable local journalism. The fruits of these investments are evident nearly every day. In just the last few months, the Inquirer has published unparalleled investigative news coverage of the local opioid crisis, lead poisoning, a devastating nursing home fire, and state and city government. One need look no further than this week's coverage of the plight of Philadelphia-area immigrants. These stories, expressed powerfully in both print and digital form, have had tremendous impact on our community and its democracy. This tale of two cities underscores the fact it remains both the best of times and the worst of times in the local news business. Never have legacy newspapers been more challenged economically, but never have donors and subscribers shown more willingness to invest. In addition to its philanthropic supporters, the Inquirer and its online home, Philly.com, now enjoy the support tens of thousands of new digital subscribers paying to access great journalism anywhere at any time. There is still much more work to do. No change in ownership or legal structure has solved the near-term business challenges facing great journalism, even here in the birthplace of the First Amendment, but they give us a fighting chance. These changes have aligned our news organization with the needs of the city of Philadelphia and given the city a direct stake in its success. At the end of the day, both Alden Capital and the city of Denver will be best served if local Colorado investors and/or philanthropists offer to take over the newspaper at a fair price, just as their counterparts did in Philadelphia. There already appears to be progress. On Thursday, the Post reported that a group called the Resurrect the Denver Post Exploratory Committee has soft-circled $10 million in investor commitments to acquire the newspaper. Among other rationale, Denver leadership should appeal to the Post's Wall Street owners to sell now before even more value is destroyed. And with one final apology to Charles Dickens, we suggest they add as a reference to local journalism, rather than to porridge: "Please sir, I want some more."